LIVE on Norwegian Epic Day 2: Beautiful Day on Great Stirrup Cay! Yesterday was our second day on board the Norwegian Epic! I slept super well the night before because I was really tired from embarkation day. Call me crazy, but I was up at 5:30 to catch the sunrise (which was STUNNING), and to take some pictures. Getting up at o'dark thirty is a lot more enjoyable at sea than it is on land! The ship was also really calm and quiet for at least 30 minutes until people decided that they had to get up so they could be the first in line at the buffet. I ate my first breakfast in the outdoor section of the Garden Cafe, which consisted of coffee and Raisin Bran (not a sponsor). When I headed back to our room at around 7:15 after taking about 58412735640576084327650794 pictures, my second breakfast was waiting for me. Our butler had brought it to the room while I was gone. I ended up only eating a chocolate croissant. Let's all just take a second to remember that calories cannot swim, and they cannot hop international borders. Thank you. The tendering process was pretty fast for us, since we are Haven guests and Emily is in a wheelchair. We got right to the front of the line. Let me tell you, those tenders are not at all handicap accessible. I honestly don't think there is any way that they could be, but it was rough. We had to get her out of her chair to walk down some pretty big steps. Keep in mind that Emily's balance is about as good as the Matzo Ball soup I had last night (it was bad if you didn't read the blog post from yesterday, which was really good, once again, unlike the Matzo Ball soup, and you should go read it) and the tender was rocking back and forth the whole time. Once we got on the island, we transferred her to a beach wheelchair, and they kept her wheelchair at security. The island was absolutely gorgeous! The weather was nice and sunny, and the temperature was perfect. 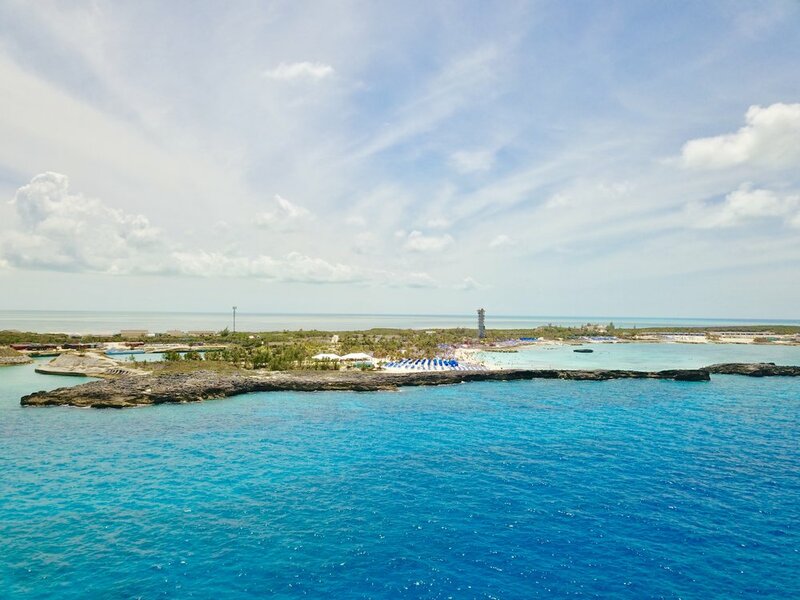 The beach perfectly showcases the ship, and the beautiful blue Bahamian waters. Everywhere I went on the island, I could see the massive Norwegian Epic. You never actually realize how big the ship your on is until you see it in a port of call for the first time. As I mentioned in yesterday's post, I managed to sneak my drone on board the ship. As promised, I took some drone footage and pictures of Epic. It was extremely nerve-racking because we knew that we weren't supposed to, but how could we resist? The airspace around the ship was protected, so it wouldn't let me fly around it. I did get some pretty EPIC shots if I do say so myself. Check them out below! Okay story time again: We keep meeting people that live in the same town as we do, and we don't even know our neighbors (by choice). Apparently the Morrissey's (and no we're not related to the attorney Joe Morrissey who does bad things) have to book a cruise and leave the country to meet their neighbors. We had a pretty relaxing day on the island, but we never actually ate anything because the lines were so long. By the time we got back on the ship at 2:30, we were all starving. I split off from Emily, Kristin, and Dan because they wanted to go to the Epic Club, but I was too impatient and hungry to wait for my food to come. I went to the Garden Cafe along with everybody else and their mothers. After lunch I quickly found myself in a food coma. I slept for two hours until I was awoken at 5:45 to for dinner. 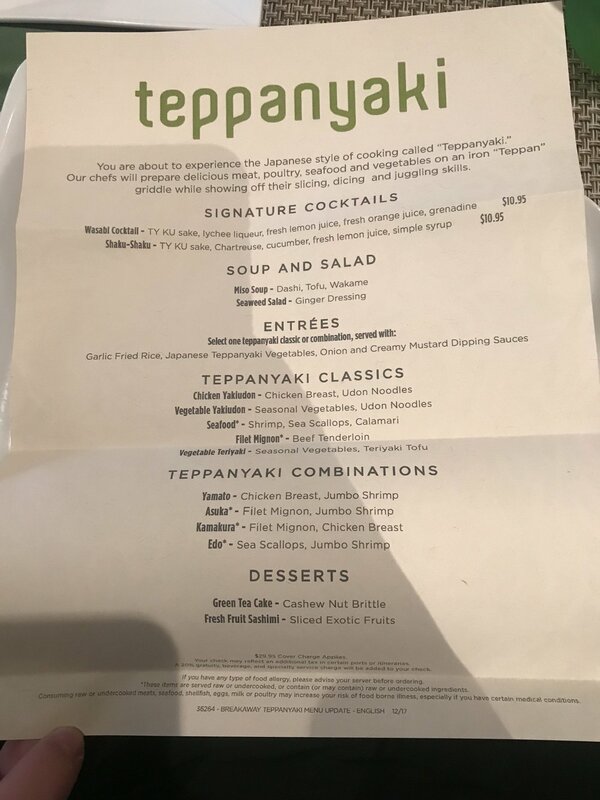 We had made reservations for Teppanyaki as soon as it was available to book online (which I believe was 90 days before sailing), because as we learned last year, reservations there fill up FAST. The food at Teppanyaki was excellent. It tasted so much better than the Chinese take-out we get at home, who's delivery people now know us by name......Joking aside, the garlic fried rice was my absolute favorite part. I got Asuka, which is half shrimp and half steak. Also very good. It is so awesome how we got our own chef for the table, and how he cooked it right in front of us! We did some shopping (against Dan's will) and some exploring after dinner. We had a very good time and we are looking very much forward to today. I hope you are enjoying these live blogs so far, and understanding my sense of humor for the most part! If you are enjoying, please take a second to share this with your friends and family! Until tomorrow, this is PJ Morrissey for Cruise Everyday, signing off. See you then! Follow along even more LIVE on Instagram, Facebook, and Twitter! LIVE on Norwegian Epic Day 3: Let's Seas the Day!